The year started with alarming news of jaguar beheadings and carcasses found floating in the Belize River. The two cases were reported two weeks apart. In a country that is world renown as the first to have established a jaguar preserve, the Cockscomb Basin Wildlife Sanctuary (CBWS), this was two, too many, in such a short period of time. Alarm rang out through every media channel in the country. A reward of BZ$10,000 for information that would lead to the capture of those responsible for the killings was publicized by the responsible Ministry within a day of the discovery of the second carcass. Jaguar protection has been getting a lot of attention in Belize since the early 1980’s. Dr. Bart Harmsen, Panthera Jaguar Research Fellow at the University of Belize Environmental Research Institute (UB ERI) since 2010 provides insights on jaguars in Belize. Prior to working at the University under a joint collaborative UB ERI-Panthera program, Dr. Harmsen had the opportunity to complete his post-graduate research on jaguar ecology in the CBWS. In 2006 he successfully completed his Doctor of Philosophy degree (Ph.D.) graduating from the University of Southampton in the United Kingdom. Dr. Harmsen stayed in the country working five years out of the CBWS. His general love for carnivore ecology, predator-prey relations, carnivore community coexistence, carnivores in a human dominated landscape and corridor ecology is the main reason he remained. His overall aim, as that of the national university, is to build local capacity for wildlife research. Together with Dr. Rebecca Foster of Panthera, Dr. Harmsen currently coordinates a national wildlife monitoring and conflict resolution program, studying the general ecology of wildlife in their natural environment and how wildlife persists in human dominated landscapes. Dr. Harmsen has authored numerous scientific publications on wildlife ecology in Belize and is an invited member of the International Union for Conservation of Nature (IUCN) cat specialist group. According to Dr. Harmsen, “most Belizeans have a close and easy relationship with nature. Some persons from the villages are still able to see a vast number of wildlife in their area”. This translates to some people seeing wildlife as a resource available to all. However, in many areas others are already experiencing the scarcity of game species. Similarly, some believe that there are many jaguars in Belize. But, with a changing environment, there must also be a change in the way we look at wildlife in the country. Deforestation has a lot of negative effects on wildlife in areas where land is being cleared for crops, cattle rearing and housing. For example, persons who used to be able to hunt game meat in the past now have to buy it. Scarcity of food and a shrinking of their habitat is also contributing to more cases of jaguars hunting livestock. Understanding jaguar ecology can help not just jaguar conservation efforts but overall efforts to ensure the persistence of forests, all the plants and animals that reside in them, and the benefits forests they provide to the Belizean population, such as regulating climate and making fresh water available. This is because jaguars are considered an “umbrella species”, meaning that forests used by them and protected for them will also be used and protected for their prey, as well as all the goods and benefits forests provide to humans. A very important tool being utilized in jaguar and wildlife research is the remote camera trap. Belize has a large number of camera trap studies and this means that the country has one of the highest densities of camera traps per square kilometre in the region. Camera traps are a very cost effective means of monitoring wildlife. They are equipped with infrared sensors that trigger the camera when an animal walks past. They are used to obtain critical data about wildlife and their habitats. One of the advantages of camera traps is that they can collect data without having to disturb the photographed animal with constant human presence. The camera helps to study this shy, nocturnal, cryptic cat and allows researchers to review the images captured in their absence. These can be fixed to trees in any area of the jungle or close to farms where jaguars have been sighted. The cameras operate continually and silently. Utilizing camera traps can help researchers work with farmers that might be negatively affected by wildlife eating their livestock. Generally, farmers know that cats and other wildlife are passing through their farms through footprints and other signs. But they do not necessarily know which carnivore (e.g. jaguar, puma or coyote) is responsible for killing their animals. In the case of jaguar attacks on livestock, because the jaguar spot patterns allow for recognition of individual animals from the camera trap photographs, farmers are actually able to know not just that a jaguar may have been responsible for the death of their animals, but also which exact individual jaguar is responsible. This type of information can prevent the killing of jaguars that are not actually responsible for killing cattle or other livestock. 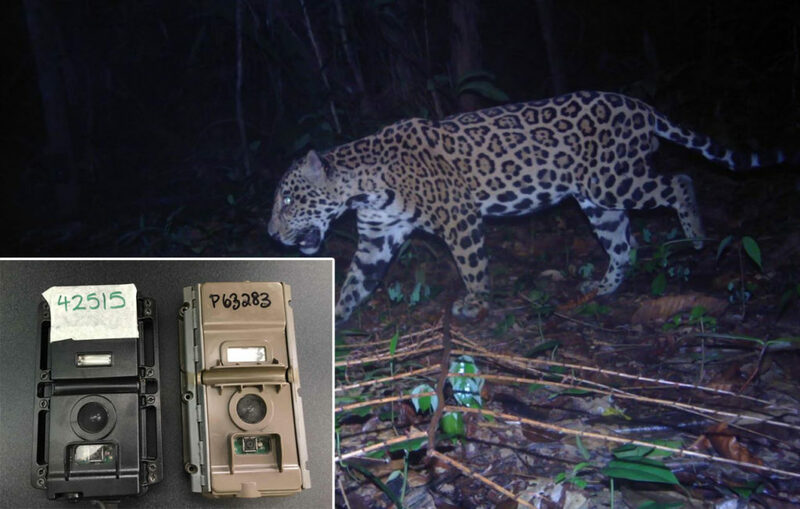 Based on studies using camera traps available throughout the country, including Dr. Harmsen’s work, the population of jaguars in Belize is estimated to be between 800 and 1,500. In the CBWS, based on research done since 2000 with the support of the Belize Audubon Society and the Forest Department, jaguars have been found to live an average of 10-12 years with a maximum age of 15 years. Jaguars roam very large areas depending on the availability of water and prey. In areas such as the Central Belize, during the dry season there is more possibility of stress on jaguars due to less accessibility to fresh water. Even in protected areas, the population of jaguars can only reach a certain point due to the natural carrying capacity an area can sustain in terms of number of prey animals. Reduction of the amount of habitat will mean a reduction in the number of available prey and subsequently a reduction in number of jaguars. If there is not enough prey species in an area some jaguars will move out of the area, looking for better hunting grounds. The laws of Belize allow for protection of property and livelihood, for example when a jaguar is discovered killing livestock. However, making a few changes can alleviate the need to kill jaguars. Continuous dialogue with famers is crucial. Dr. Harmsen says that the ability to preserve wildlife as human population and human needs increase is very difficult. However, it is not impossible. Some suggestions by environmentalists might seem impractical to implement, but finding common ground that can be equally beneficial to all is the aim of most conservation groups in this day and age. Camera traps (insert) have helped to study this shy, nocturnal, cryptic cat. Some cattle farmers that have implemented suggestions such as clearing the area around their cattle ranch and improving lighting to ensure that jaguars are aware that they are out of the jungle, have reported a decrease in the loss of cattle. Another suggestion is to take calves closer to a ranch house instead of leaving them out in the open. More research has to go into the sustainability and returns for alternative methods of making money outside of cattle farming in these isolated areas, for example through ecotourism which is based on the country sustaining viable populations of iconic, charismatic wildlife such as jaguars. In 2017 conservation stakeholders from throughout the country came together to form the National Jaguar Working Group. 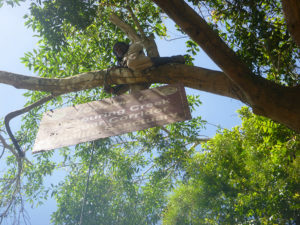 This group chaired by the Forest Department, includes the UB ERI and other organizations such as the Belize Audubon Society, and The Belize Zoo. The expertise from members of the working group is aimed at providing collaboration for the common goal of jaguar conservation. Dr. Harmsen says, “overall Belize is doing a great job at protecting jaguars. Many people come to Belize to study jaguars and as tourists to be in the land of the jaguar wilderness.” Based on wildlife studies, jaguar populations in Belize can be considered extremely healthy for the region but attention needs to be given to habitat loss, especially for connectivity of jaguar populations through corridor areas such as Central Belize. However, with the work that continues to be done, for example through collaborative efforts such as those of the National Jaguar Working Group, Belize can be the beacon for how to manage jaguars in a country with a growing human population, while ensuring thriving agricultural and tourism industries.